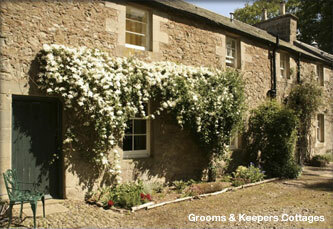 Keeper's Cottage is a stylish self catering holiday rental in the Scottish Borders. It is located in the former stables at Wedderburn Castle. 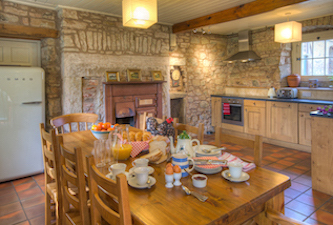 The cottage has been renovated to a high standard and it is particularly suitable for family and group hoildays. Features include a spacious farmhouse-style kitchen with a large table for family meals, stone walls, fireplace with decorative range and a fully-equipped modern kitchen. 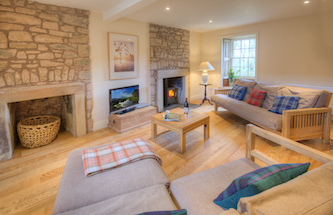 The sitting room has a stone fireplace with wood-burning stove, large flat-screen television and comfortable sofas for kicking back in front of the fire. There are wooden floorboards and antique floor tiles throughout the ground floor of the cottage, with the floorboards cut from a single ancient ash tree that grew beside the castle and fell in a storm. The first floor has two bedrooms: one double and another that can be used as a double or twin room. The double bedroom has an oak bed and en-suite bathroom with luxurious 1.8m bath and rain shower, limestone tiling and wooden floors. 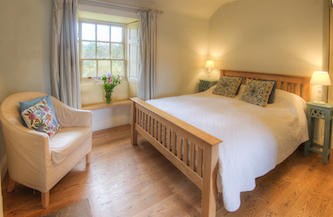 The second bedroom has a private bathroom with antique roll-top bath for long soaks after country walks. 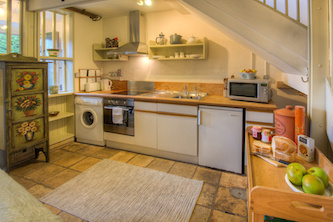 Both bedrooms are furnished in a charming cottage style. Grooms Cottage is an intimate, vintage-inspired one-bedroom holiday cottage beside Keepers Cottage at Wedderburn Castle stables. The comfortable downstairs area of this rural retreat consists of a kitchen, sitting and dining space with open fire and floor tiles that were salvaged from the former dairy at Paxton House. Upstairs there is a double bedroom and newly-renvoated bathroom. Grooms and Keepers Cottages are surrounded by parkland, private driveways and woodland offering attractive walks and views of the Cheviot hills. The properties have a cottage garden with garden furniture and grass lawn, making them perfect for relaxing on a summer day and for BBQs. Parking is available outside the cottages. "The property is lovely and had everything we needed. We would not hesitate to recommend this place."